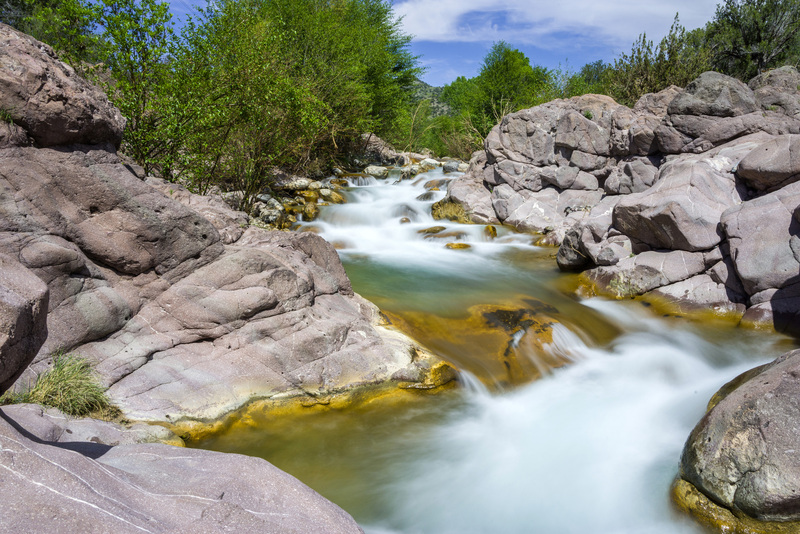 The Sally May site on Fossil Creek Wild and Scenic River offers some of the best swimming along the entire creek. There are two parking areas on either side of the bridge, which crosses Sally May Wash, on FR 502 (the Childs Power Road). Each lot has a path leading to separate pools along the creek. On the east (upstream) side of the bridge, the path leads to a large, deep pool at the base of a steep water feature. Rock shelves and cliff walls provide a lot of great spots for sunbathing and enjoying the canyon views. A smooth rock outcrop makes a great jumping-in spot. A small sandy beach at the far end of the pool offers shallow water entry and a good spot for smaller children to play. On the west (downstream) side of the bridge, there's a large open area above the parking lot that makes a great spot for a family picnic. The path to the creek leads to another swimming hole at the base of beautiful water feature. There are rocky banks to relax on, and a shallow sandy entry point not far downstream near a gravel-bottomed section of creek that is a great place to wade and splash. A bit of the creek's history remains along the banks here, structures from the days the Childs-Irving hydroelectric power plants used the creek to generate power for nearby mining communities like Jerome, Arizona. Photo by Coconino National Forest.